Dracula (1979) Review – AiPT! So, I’ve been trying my best to view all the various versions of Dracula that have been made over the decades. That’s a more time-consuming feat than it sounds since, unless the figures have changed, Count Dracula ranks as the number one fictional character with the most movies dedicated to him. 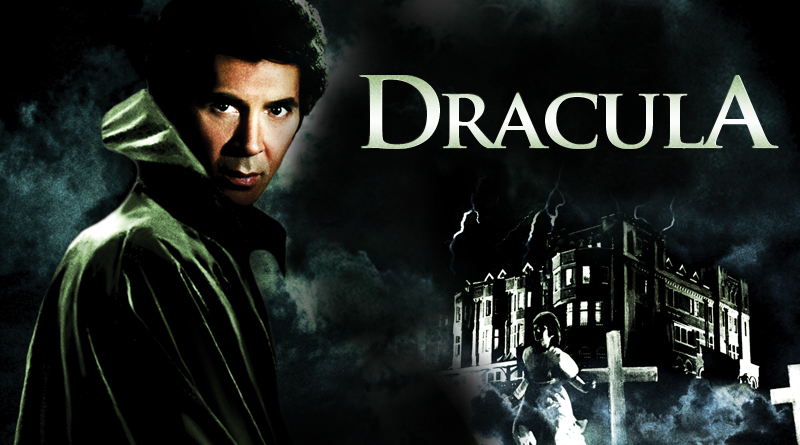 I’ve been hitting the more well-known offerings lately, such as the classic Universal Studios Dracula and its various sequels, Hammer’s Horror of Dracula and its tremendous quantity of offspring and the more modern fare, such as Bram Stoker’s Dracula. In my journeys, I’ve found that between Hammer’s series and the Francis Ford Coppola revival, Dracula kind of took a break from the limelight. Though slim pickings, my understanding has always been that the best Dracula film from this period was John Badham’s Dracula produced in 1979. “Best” is a pretty relative term, by the way. En route from Romania, a ship crashes against the rocks below the Seward Sanitarium. The only survivor of the gruesome disaster is Count Dracula (Frank Langela), who has come to settle down in England. Moving into the gothic Carfax Abbey across the way, Dracula wastes no time in devouring the young Mina Van Helsing (Jan Francis), seducing Lucy Seward (Kate Nelligan) and making the lives of Jonathan Harker (Trevor Eve) and Dr. Seward (Donald Pleasance) nothing short of miserable. The death (and subsequent undeath) of Mina invites the presence of her father, Abraham Van Helsing (Laurence Olivier), who knows a thing or two about killing vampires. 1979’s Dracula marked Universal’s first big in-house attempt at reviving their most classic monster, with a rather large production budget and effects-heavy approach. The result is a very lavish film, complete with a truly gothic and foreboding setting in the sinister Seward Sanitarium and Carfax Abbey (which, aside from the boat, are the only locations you’ll see in the film). Considering Universal’s classic offerings and Hammer’s films all came across as low-key “filmed stage plays,” a truly epic and modern cinematic take on the story was definitely a welcomed first. The special effects don’t disappoint, with (from what I understand) this film being the first to include the infamous scene from Bram Stoker’s novel in which Dracula scales walls like Spider-Man (and believe me, they get a lot out of that effect). Dracula’s transformations into bat, wolf and mist are all handled quite well, particularly during action sequences (though, regrettably, you can occasionally see the strings on the bat puppet). Dracula also has one of the coolest love-making scenes I’ve ever seen in a horror movie, and I’m not saying that because I’m some kind of pervert or something. As Dracula takes Lucy in her bed, they are both suddenly transported to this psychedelic universe where they hover in midair amidst a blood-red cloudy inferno. It’s pretty cool-looking. But great effects and set-design are only half the battle, I’m afraid. Where Dracula fails is the casting department. Hard to believe, I know, what with such big names as Frank Langela, Laurence Olivier and Donald Pleasance all taking major roles. Like most people my age, I recognize Langela from his career-defining role as Skeletor, opposite Dolph Lundgren’s He-Man in the live action Masters of the Universe film. I’m sure Langela doesn’t like to think of that as his career-defining piece, but hey, too bad (incidentally, Two-Bad was not in the live action Masters of the Universe film). Langela’s Count Dracula just doesn’t mesh with how the Count should be portrayed, in my opinion. He’s too youthful and unimposing a presence. He doesn’t come across as an immortal, supernatural evil. Instead, he has all the menace of that guy who shows up at a party and loudly hits on your girlfriend while she’s standing right next to you and doesn’t give a s--t. He’s not so much evil as he is just an a-----e.
Laurence Olivier’s Van Helsing also stands as something of a different take on the character. In most incarnations, including the book, he’s this fearless, jovial, all-knowing expert on how to f--k vampires up six ways from Sunday. Here, he is presented as a grieving father, looking to avenge his daughter’s death and undeath. While he retains his knowledge of vampire killing, he’s presented mostly as a sad old man. Olivier’s performance in that regard is convincing, but that’s not how I’ve come to picture Van Helsing. Still, I’ll take him over Hugh Jackman for whatever that’s worth. So far as altering the original story goes, I can’t say I’m pleased with some of their changes. As with Horror of Dracula, the characters of Lucy and Mina are switched for no readily apparent reason. I didn’t so much mind Mina becoming Van Helsing’s daughter, but it could just as easily have been Lucy (it’s not like Lucy was Dr. Seward’s daughter in the book, either). If there’s one major offense that disappointed me, it’s that they did away with the opening sequences in Dracula’s castle, my favorite part of the book and the part of the film adaptations I look forward to the most. The design of Carfax Abbey seems to be a measure to rectify this omission from the source, as it suddenly becomes as isolated, gothic and gloomy a place as Dracula’s castle ever was. John Badham’s Dracula has its strengths and its weaknesses. The effects, locations and set-designs are some of the best you’ll see in any adaptation of the story. Unfortunately, it drops the baton at the casting, and that’s sort of an unforgiveable failing. If you’re into a rather offbeat rendition of the classic characters, or at least don’t have a certain ideal for them set in stone, then you’re probably going to love the movie. Unfortunately, I’m not you.